Data management gets lost in the enthusiasm around Artificial intelligence (AI) and machine learning (ML). Not surprising, when it's an algorithm that decides what search results to show you, guides the self-driving cars on the roads, and powers the anti-fraud bots that monitor every credit card transaction we make. Health and Human Services (HHS) agencies across the country have been slow to adopt these advanced analytics. Why is this? Is our industry somehow special? Are we less sophisticated? Or are we just more set in our ways? The answer to all three of these questions is some flavor of yes, and it boils down to data management. Managing the diverse data needs of a modern HHS enterprise takes careful planning and execution. We are being tasked with integrating data from an ever-increasing number of sources, both structured and unstructured, to get a more cohesive picture of the stakeholders we serve. Handling this velocity, variety, and volume of data is no simple task for even the most technically advanced programs. To further compound the issue, data provided by various source systems is often outside of your direct control and is of mediocre quality at best. When dealing with many disparate source systems, duplicate data is unavoidable, thus triggering the need for an enterprise wide data management approach. 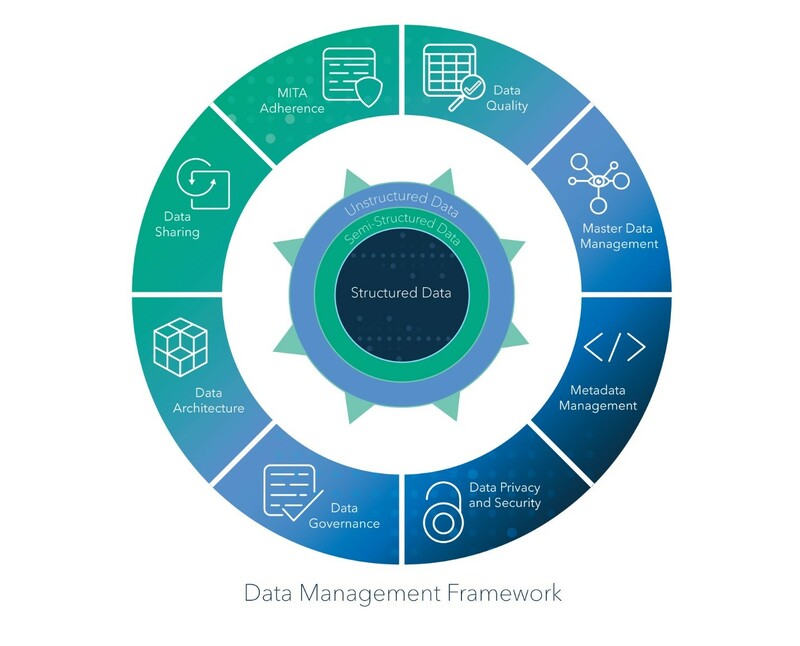 A comprehensive data management approach is supported by several interrelated disciplines that support one another – if one fails, the others will fall with it. Properly implemented, a cohesive approach to data management will provide both business and technical direction in many areas. WARNING: Prepare to enter the data management weeds! A proper data management framework is necessary before health care agencies can consider more advanced analytics. 1) Medicaid Information Technology Architecture (MITA) Adherence – Make sure your strategy aligns with MITA architecture, business processes, and the CMS Seven Standards and Conditions. 2) Data Quality – Prevent garbage in to prevent garbage out. Operational and analytical data quality rules are applied to your data upon receipt. Dashboards and alerts are published to stakeholders. 3) Master Data Management – MDM provides a single source for managing reference data. Enterprise-wide entity resolution identifies unique citizens, providers, facilities and families. 4) Metadata Management – How great would it be to have seamless sharing of metadata across the entire solution from ETL jobs to analytics and reporting? 6) Data Governance – A formal data governance practice provides executive leadership and enables data stewards to make informed and effective decisions. 7) Data Architecture – Establish a single version of the truth in your data warehouse with an integrated data model based on business domains. By working top down from business requirements, we ensure the structure is intuitive to the end user. 8) Data Sharing – If stakeholders can’t act after all that other data management work, then what’s the point? Both internal and external to the organization can get the data they need, where and when they need it. Deliberately defining a data management strategy is central to the success of any enterprise. It’s the secret sauce behind how we use and secure information, ensure compliance, operationalize transparency and reduce expenses. Getting to a stable point takes time, planning and hands on leadership. If any one of these eight pillars fail, the objectives of the agency are in jeopardy. To get the most out of your data assets, there are no shortcuts. Establishing a data management framework is a necessary step that will soon have you saying, “We CAN do that in healthcare”.